Blog Kryptonite – As in MARVEL Comics? Ed Warnock, CEO of the Perlan Project, passed this on from Michael Coates, head of Pipistrel USA. Despite its celebrated author and totally credible source, the following press release is open to scrutiny and will no doubt receive some rabid criticism. “Pipistrel ALPHA Electro completes 24 hour flight on a single charge! “The Pipistrel ALPHA Electro aircraft has successfully smashed the world endurance record for electric aircraft by completing its first 24-hour flight on a single charge! “Pipistrel engineers have recently tested different fuel cells and generator units to supplement the ALPHA Electro’s current 1-hour range. “Hugh improvements in electrical generation have unfolded with the recent (2016) re-discovery of Kryptonite in Northern Siberia and under the stepped Pyramid in Egypt. “Kryptonite in its purest form is just amazing, a true MARVEL producing almost unlimited amounts of perfect DC energy, ideal for powering an electric aircraft noted a leading Pipistrel engineer, Prof D.C. Currant. “Prof Currant explains, that less than 1 teaspoon of kryptonite mixed with a catalyst of egg whites and Coke Zero can product almost unlimited energy with the only by- product being a bad tasting, dark brown, scrambled egg type mix that can be fed to animals (and men) to keep them warm in winter. “Guinness book of world record officials were in attendance for this world first event and described this as a ‘giant leap for mankind’ moment! In Less Controversial Pipistrel News…. 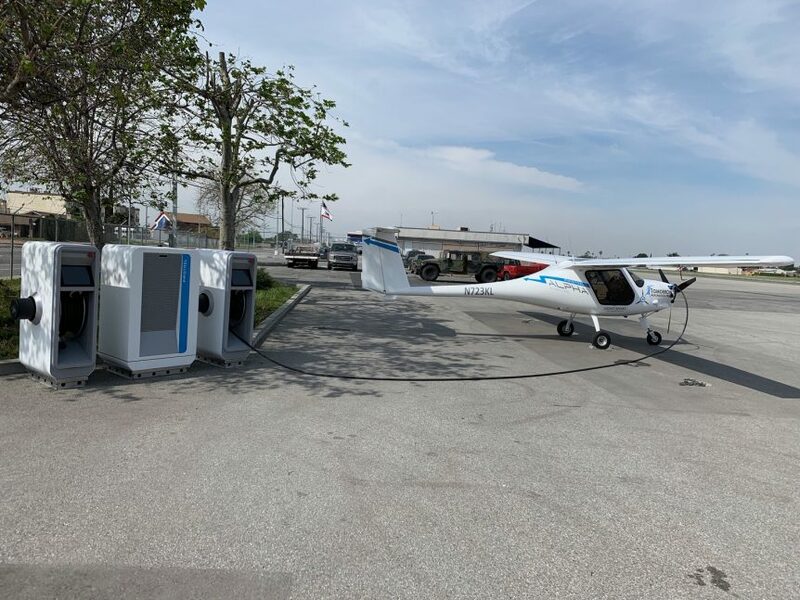 Pipistrel (for real)) announced completion of the first of five charging stations installed in the United States. Completed at Compton Airport near Los Angeles, California, the SkyCharge station can charge two electric aircraft at the same time. So far, Alpha Electros are limited to one-hour cross-country flights, but with chargers coming soon to Reedley Municipal Airport (032), William Robert Johnston Municipal Airport in Mendota (M90), Fresno Chandler Executive Airport (KFCH), and Fresno Yosemite International Airport (KFAT), there will be plenty to see in the Los Angeles Basin. Pipistrels will fly one hour, recharge for an hour, and continue on to another destination. 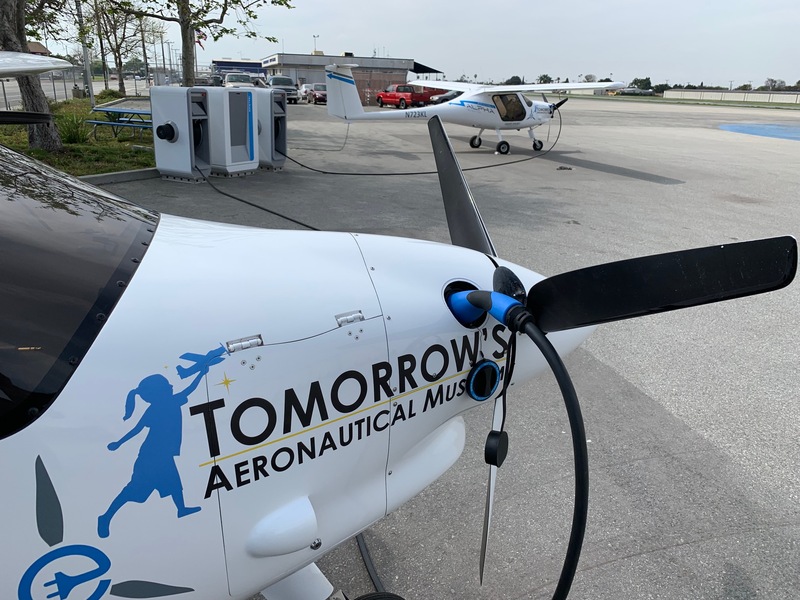 Aircraft are owned by Tomorrow’s Aeronautical Museum based on the Compton Airport and part of a network working to provide aviation opportunities to disadvantaged youth in the region. Ending Pipistrel’s press release on the charging stations, this happy quirk in electric flight became known. “Electric aircraft, whilst still in their infancy are definitely the way forward for the light aviation training and local scenic flights industry especially in noise sensitive areas. “Recent noise testing of the Pipistrel ALPHA Electro aircraft has validated that during a 500 feet fly over the aircraft cannot be heard above ambient noise levels.